Did you know that in past studies, avocado-eaters have been shown to be healthier than non-eaters? Chowing down on the fruit (yes, avocados are technically berries!) is associated with a lower body weight, a lower body mass index (BMI), a lower intake of added sugars, higher nutrient levels, and a better-quality diet overall. It makes perfect sense, then, that a new review of medical literature shows that eating avocados may help you avoid metabolic syndrome. 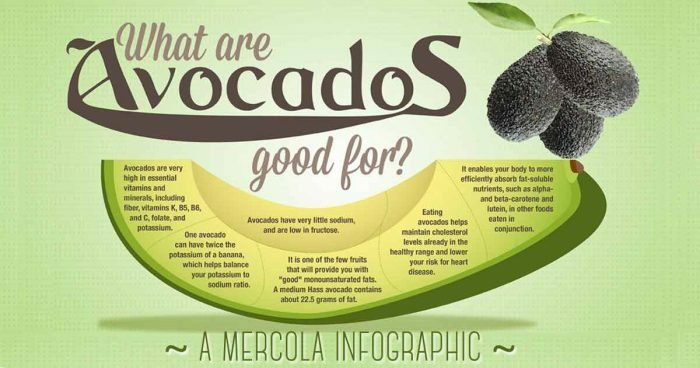 Avocados were shown in the studies to have the most beneficial effects on cholesterol levels. Furthermore, the researchers concluded that avocado consumption can influence LDL “bad” cholesterol, HDL cholesterol, triglycerides, total cholesterol, and phospholipids. Phospholipids, along with protein, are major components of cell membranes. So, to translate, there isn’t really any aspect of metabolic syndrome that avocados can’t fight, and there isn’t any part of the avocado that doesn’t have these abilities. The creamy fruit even “melts” belly fat, considered the most dangerous type of fat to carry on the body. Yes, metabolic syndrome has been dubbed the “new silent killer,” but avocados have been deemed a “perfect food” because of their countless health benefits. Avocados are a reliable source of vitamin E, which is vital for protecting brain health and preventing Alzheimer’s disease. They’ve even been shown to reduce the signs of aging by combating free radicals. So whip up a batch of guacamole, throw some avocado slices on a sandwich, or cut one in half and bake an egg inside of each half. This is one food you should make a part of your daily routine.